Ilocos is the top producer of onions in the Philippines. Accounting to 99.8% of the much sought after spice. This is then translated as an economic boon for the countries that plant and harvest onions. With an output of 9.22 thousand metric tons, Ilocos is top in onion production. But recent data from the Philippine Statistics Authority (PSA) disclosed that there is a decrease of 5.1% in the production of native onion registered in the 4th quarter of 2016. This can be attributed to production and post-production factors. These can be attributed to climate and weather conditions, dearth of planting materials and disease and infestation. One of the diseases is “Twister Disease”. It causes having the plants produce slender bulbs thus greatly reducing the yield. 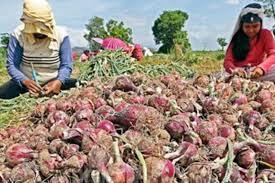 It has affected not only the Ilocos region which is the top onion producing region but also Cagayan Valley and Central Luzon. Scientists at the Central Luzon University (CLSU) in Nueva Ecija are conducting research with regards to managing the disease. It was discerned that frequent rains and high humidity greatly contribute to the spread of the disease. Twister Disease” is a fungal infection and thus humidity, length of exposure to moisture, exposure factor to light and even temperature are factors. Inoculated onions were thus introduced and trials were undertaken so as to know the parameters wherein the disease will proliferate. Samples were gathered from tye onion producing areas os Ilocos Norte, Ilocos Sur, Batanes, Mindoro Occidental, Nueva Vizcaya, Tarlac, Pangasinan and Nueva Ecija. The findings from these experiments will decide which management and protocols can be used for optimum effect with regards to proper fungicides and gibberellin inhibitors that will effectively control twister disease in onions. The research is being supported and funded by the Bureau of Agricultural Research (BAR).